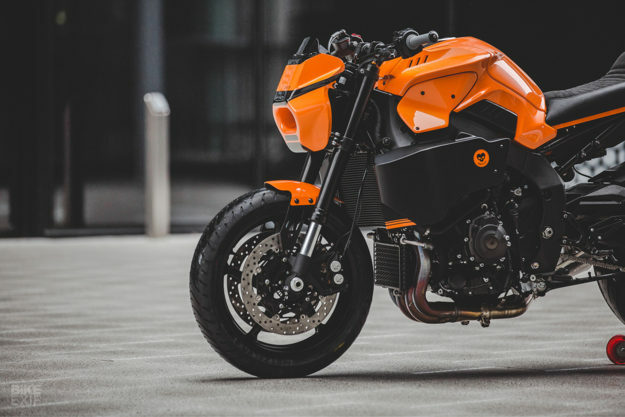 The Yamaha MT-10 is about as mental as naked bikes get. The 998 cc inline-four makes a stonking 158 hp and 111 Nm of torque, and backs up those numbers with razor-sharp handling. 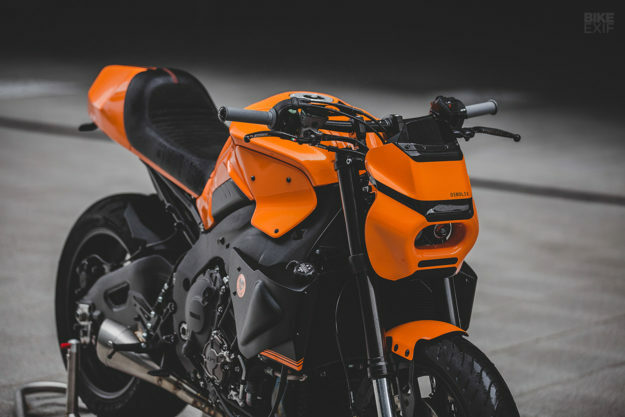 But with layer upon layer of angular plastics—and even fake air ducts—it’s the antithesis of everything the modern custom scene stands for. That’s a minor hurdle for our friends in south London, deBolex Engineering. 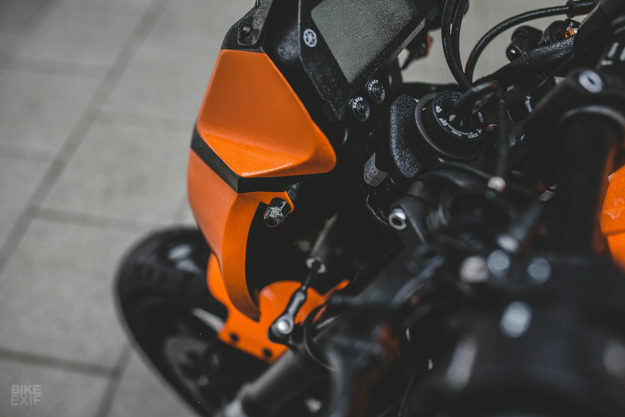 Partners Calum Pryce-Tidd and Des Francis have developed a reputation for building tasteful motorcycles using traditional methods and meticulous re-engineering. 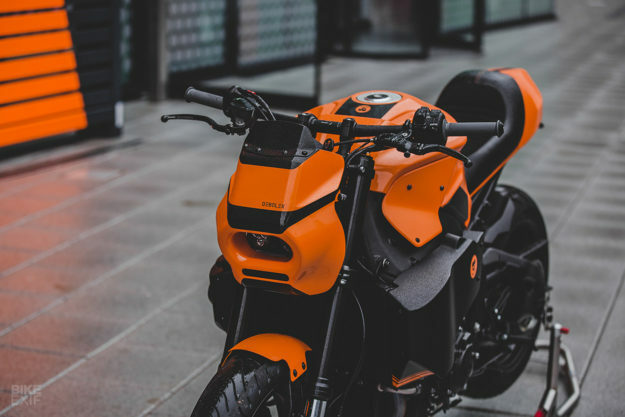 Now they’ve used their skill set to rework the Transformers-like MT-10 into a machine that is still mechanically aggressive, but far more refined visually. 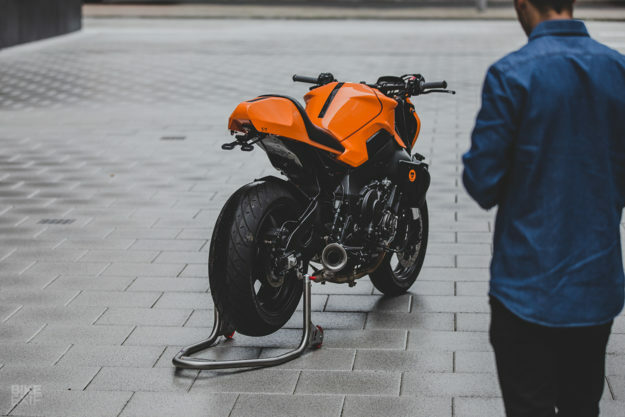 The project was based on a brand new MT-10, commissioned by a company called Bonesheart to promote a custom motorcycle lottery. With an open brief, deBolex set out to refine the lines of the Yamaha. “It was particularly challenging to slim down, being such a big bike,” Calum explains. Step one was to peel off as much plastic as possible. 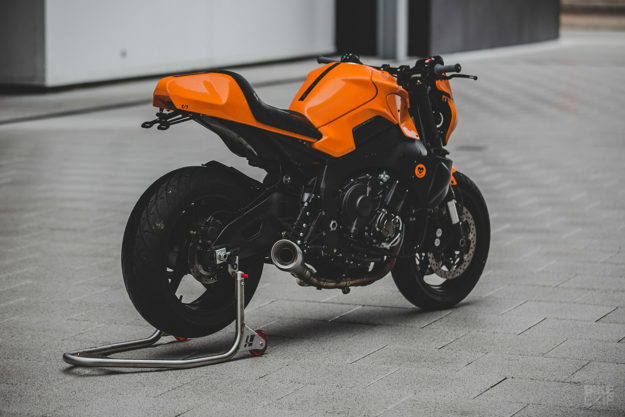 Parts like the Yamaha’s faux air intakes and robot-esque headlight assembly went straight into the bin. 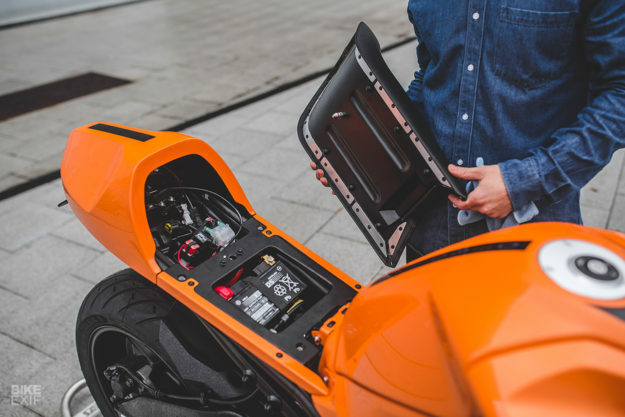 That immediately put the bike on a visual diet—but it also exposed a ton of wiring that needed to be relocated. Then it was time to build the big naked up again with fresh, custom bodywork. Calum and Des are supremely old school in their techniques. They almost exclusively work with aluminum, bending and shaping it by hand to create fresh bodywork. 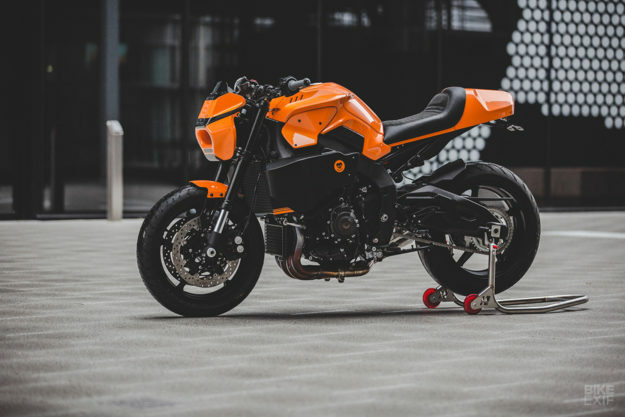 Their biggest inspiration comes from classic racecars—a design ethos that clashes massively with the MT-10’s ultra-modern design. But somehow, they’ve made it work. The updates include a new headlight nacelle, with recessed LED headlights and a neat little smoked windscreen. 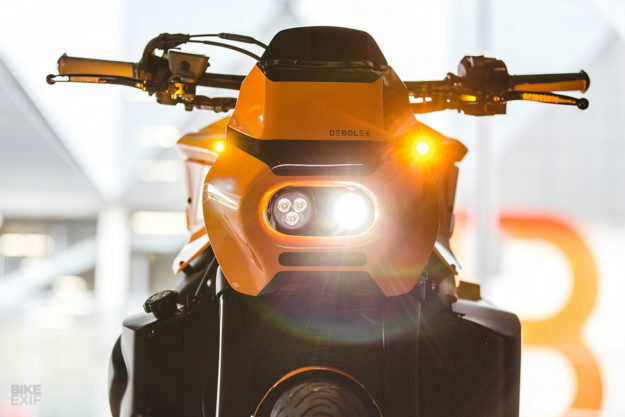 The stock MT-10 speedo is nestled behind it, and it’s flanked by teeny LED turn signals. There’s a custom-built mudguard lower down too. DeBolex kept the stock fuel tank, but fitted a gorgeous Rizoma gas cap to it. Then they built up new panels to fill the gaps left by all the plastics they ditched. Those include a small pair of wings on the tank, and larger sections lower down to hide away electronic components and the radiator expansion bottle. Next, it was time to fabricate a new tail section to match the tank’s lines. And it’s here that deBolex’s obsessive attention to detail really shines. Peek around the back, and you’ll see how the tail hump is completely enclosed underneath, without a single hard metal edge showing. The taillight, license plate holder and rear turn signals are perfectly integrated too. And the Alcantara- and vinyl-clad seat (upholstered in-house, mind you), pops off quickly via the stock seat latch, giving the rider quick access to the primary electronics. 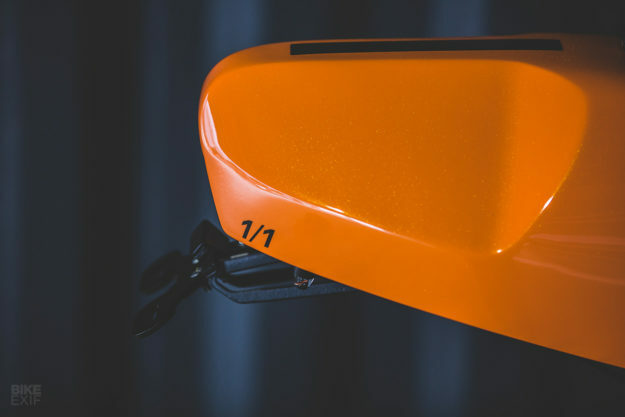 We’ve quizzed deBolex on these considerations before, and they’ve explained that their ethos values design and practicality in equal measure. 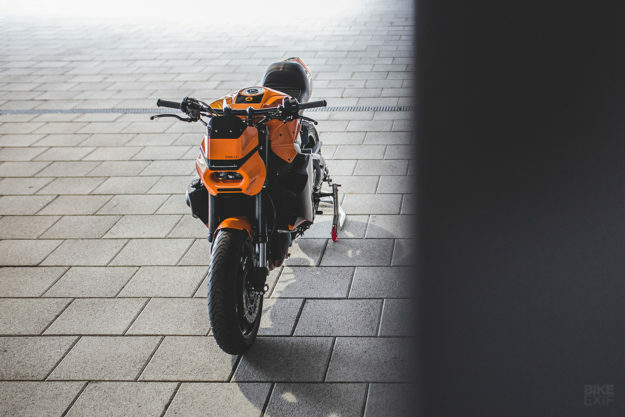 With the MT-10 already lauded for its road holding and handling, there was little need to fettle the geometry, or upgrade the suspension or brakes. The guys simply installed fresh Metzeler rubber for more grip. They did upgrade the exhaust system though. 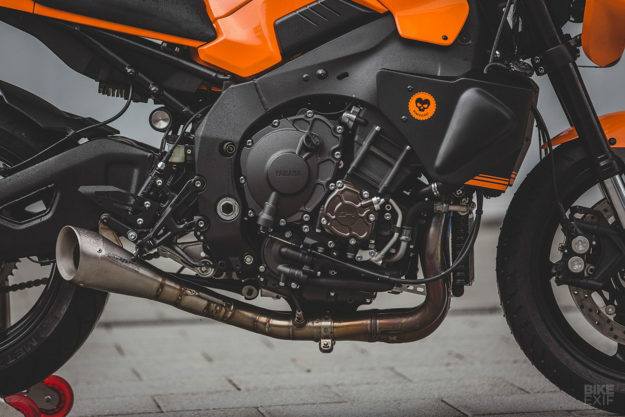 It now features hand-made stainless steel headers, terminating in a Spark silencer. And they tweaked a few finer details too. The cockpit’s kitted with Rizoma bars and bar-ends, Renthal grips and Accossato controls. There are Pro-Bolt fasteners throughout the bike, and Calum and Des even went to the trouble of refinishing the rearset mounts in black. 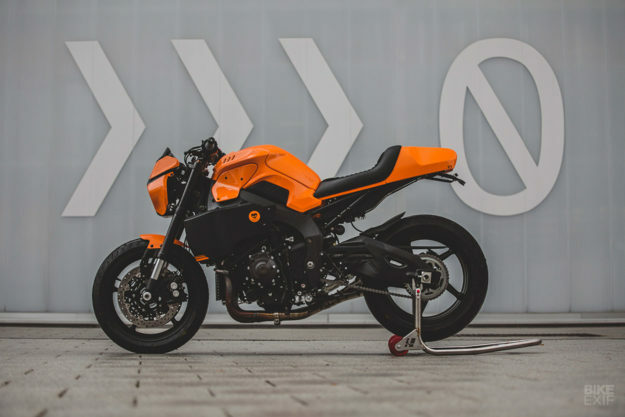 We never thought we’d have a crush on an orange Yamaha MT-10—but color us smitten. And knowing that deBolex haven’t hampered the capability of the ‘hyper naked’ makes it even sweeter.